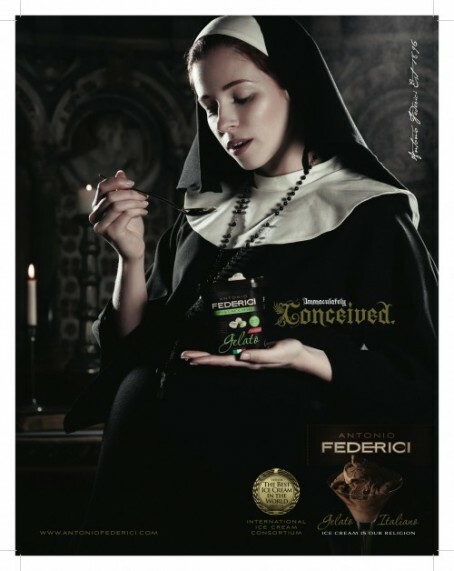 This ad for Italian gelato maker Antonio Federici, which ran in Britain’s Look magazine, has been banned by U.K.’s Advertising Standards Authority. The ASA claims to have received all of six (count ’em six!) complaints about the ad, and ordered the ice cream company not to run the ad again. The gelato maker launched the ad in the latest edition of Look in retaliation to the ASA’s banning of another ad the magazine ran last month (seen below). The ad featuring the pregnant nun wasn’t the first time Antonio Federici ran into problems with British authorities either. Last year, the ads seen below were also banned by the ASA. I imagine we’ll see an equally offensive ad coming in the next edition of Look as well. The Italians are obviously taunting the Brits and their sill advertising standards, and I assume the ASA will eventually threaten a huge fine to get them to stop. But until then, Antonio Federici will continue to run the controversial ads and enjoy the copious free publicity and likely surge in sales that come with it. 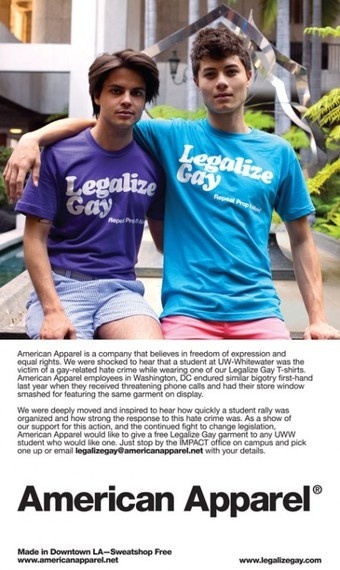 Did American Apparel Spin Gay-Bashing Incident Into PR Opportunity? Last month Lauren Meyer, a student at the University of Wisconsin-Whitewater, was attacked and viciously punched in the face by two men for wearing an American Apparel “Legalize Gay” t-shirt. Naturally, the incident sparked outrage, and American Apparel quickly stepped in and sent 500 of the t-shirts to the UWW campus. The clothier also took out a full page ad in the student newspaper (pictured above), which declared itself an ally to the GLBT community. “First, let’s get this out of the way: Any company that comes to the defense of our community deserves commendation. For every outfit like American Apparel that lauds The Gays with attention and good vibes, in good and bad times, there are thousands that ignore us, even when attacks against us happen in our own communities. In AA’s defense, the company wrote an email to a Gawker blogger who wrote on the subject to point out that the chain gave the t-shirts away free of charge and made no money for the donation. Furthermore, AA has no stores within an hour’s drive of Whitewater to take advantage of the publicity and has no plans to open one anytime soon. The blogosphere has been abuzz with the release of a study by Microsoft and the Max Planck Institute in Germany that reveals that Facebook’s ad-targeting program can potentially out gay users to advertisers. Researchers monitored six fake profiles of varying gender preference:one gay man, one lesbian woman, two heterosexual women and two heterosexual men. While the ads for the heterosexual and lesbian women weren’t so different, those of the gay and heterosexual men were. 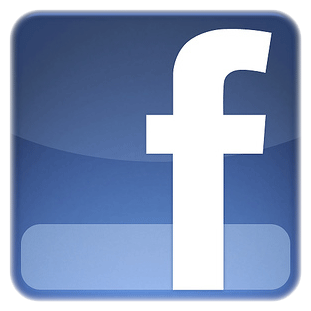 The study found that even if a Facebook user’s profile in no way indicates that he or she is gay, one might infer that he or she is gay based on the user’s interests and the ads he or she clicks on. While I have railed on Facebook’s advertising policies in the past, I think the public’s reaction to this study has been much ado about nothing. By now, anyone with a Facebook profile understands that there are inherent privacy risks involved. Besides, Facebook’s ad-targeting service does not broadcast that a certain user is gay, it simply says that based on that user’s interests, he or she might also be interested in some gay-oriented products or services. Just like when I visit CNNSI.com I am shown ads linking to straight-oriented websites, like that of Sports Illustrated’s annual Swimsuit Edition (which I could not be less interested in). With the advent of contextual and behavioral ad targeting the same risks are present anytime someone visits a gay-oriented website and clicks on a banner ad, whether or not that ad is for a gay-oriented product or service. The simple fact is, every time we surf the web, we run the risk of revealing personal information tied to our IP address just through the way we navigate the internet. Living in the information age affords us previously unimaginable convenience, but it is not without its drawbacks. 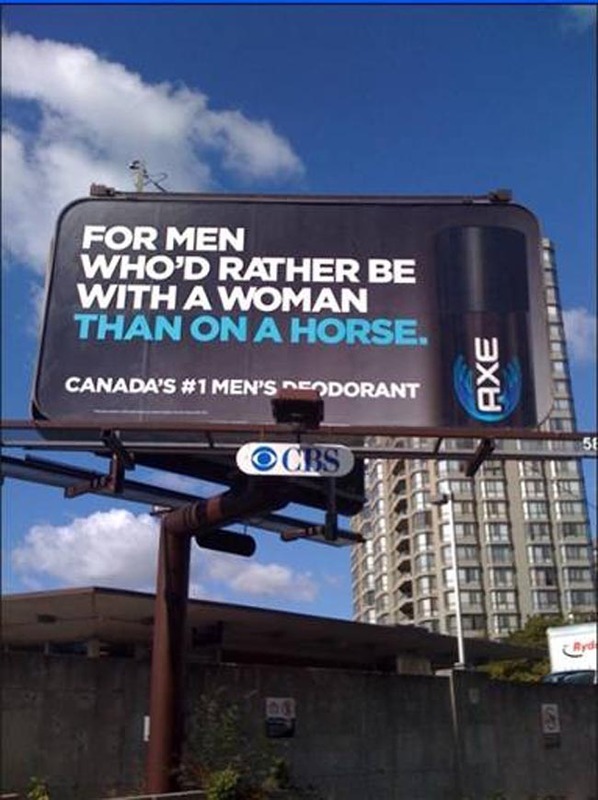 This billboard for Axe deodorant recently appeared in Canada as a response to Old Spice’s wildly popular “I’m a man” commercials. I wouldn’t call the billboard offensive, but as a gay man, it is certainly off-putting. While I don’t know any gay men who would actually wear the foul-smelling fragrance, Axe has definitely excluded a segment of its target population with this creative. For what it’s worth, Axe is manufactured by Unilever, which scores a 100 on HRC’s Corporate Equality Index. Never before have agencies and corporate bookers been able to search for Gay, Lesbian, Bisexual and Transgender (GLBT)-friendly hotels on the GDS (an international travel booking system). They have had to rely solely on travel guides and internet sites to fulfill their GLBT client’s needs. World Rainbow Hotels is introducing the first ever GLBT-specific rate-codes that will be bookable on the GDS as well as a selection of websites. The World Rainbow Hotels team will be promoting the new rate plans to travel agents and corporate bookers, so that they will be better equipped to offer their clients GLBT-welcoming accommodation, carefully selected through a strict set of criteria. Staff at the hotels accepted into World Rainbow Hotels rate program will need to undertake “GayComfort” training online to increase awareness and levels of confidence with requests and situations that they may not be familiar with. GLBT guests will sense this natural confidence and will therefore feel more welcome at the hotels. 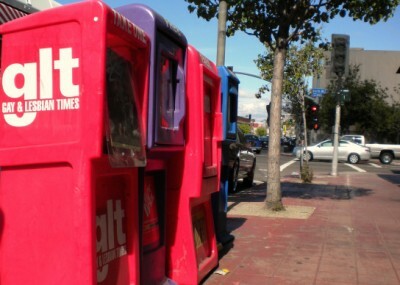 After a tumultuous year in which it was accused of overstating its circulation numbers to advertisers, it appears the San Diego Gay & Lesbian Times has shut its doors. According to NBC San Diego the entire staff has been laid off, and the newspaper failed to showed up at its usual distribution locations last week. The publication has not released any official statement, and former employees seem to be just as confused as the rest of us. In an online message, one staffer wrote that he was laid off via email with no explanation as to whether the shut down was temporary or permanent. He goes on to say his last pay check was returned for non-sufficient funds and his group insurance plan was cancelled for non-payment. The October/November issue of Echelon Magazine has been released. The latest edition of this leading GLBT business publication focuses on Employee Resource Groups. Turn to page 24 to read an article I wrote (Hiring For Diversity) on corporate efforts to attract and retain GLBT employees. In today’s business climate, more and more employers are recognizing the benefits of a diverse workforce and are stepping up their GLBT recruiting efforts.